Ever been a die-hard fan of Monster Trucks and their mayhem carnage nature. Then Top Truck is the game of your class and calling. As the name suggest, Top Truck allows players to control the big monsters and bring down total fury on cars as you progress through the game. Created by Ace Viral, this developer is no new player to the Android scene and has produced some worthy titles, but Top Truck definitely outshines them hands down. This is carnage and mayhem at its very best. The game has a very simple approach with a very well integrated intuitive gameplay to say the least. It features three varied architecture levels which include the Arena, the Jungle and Snow with some really insane settings. The game packs-in the perfect mix of adrenaline and beastly power. 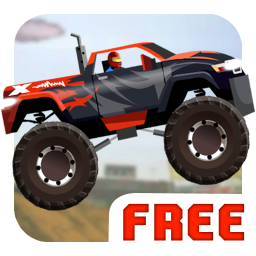 Pump the crowd with the monstrous jumps, carnage on cars all while collecting bonus points. The game features massive levels, which are as good as a free-roam games. This means that its levels has many a hidden paths waiting for the players to unravel. Keep a check out on the CROWDOMETER to measure just how famous or infamous you are among the the crowd. Keep destroying cars and houses to keep the crowd hooked. Top Truck can be played with either the accelorometer or the slider. Overall, the game is great and deserves a minimum 4 stars. It has visually appealing graphics and a not-so-confusing gameplay system. A must try for every Droid user.